As has been previously announced, Readysell and Office Brands have been working together over the last few months to improve the data integration capabilities of Readysell with the Office Brands product database. This has been achieved by automating the flow of data directly from the Office Brands product database into Readysell 7 member systems. New catalogues are listed under their catalogue code. Updates have the same catalogue code with the word “-UPDATE” added to the end of the catalogue code. The date loaded shows when you last loaded the catalogue. If the date last modified is greater than the date loaded this would indicate additional updates and should be reloaded. The catalogue will show in the outstanding catalogues list. 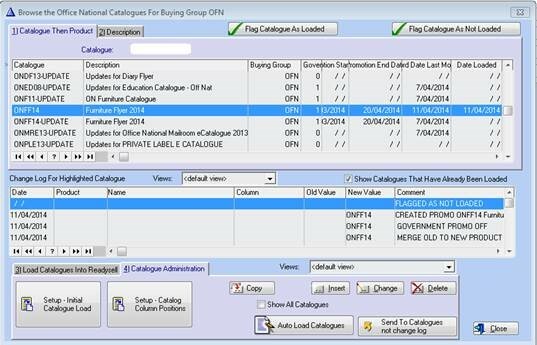 The Office Brands One-X data updates the price book Readysell have added additional functionality to load a catalogue that selectively update cost and sell prices for existing products found on your product file. It will include all the updates in all the other catalogues.